/ Man hat hier am Fuße des Nordgrates des Schalfkogels, wo der Diemferner von der Venterseite heraufzieht, die Möglichkeit einer direkteren Einfahrtsmöglichkeit auf den Schalfferner. Allerdings beträgt hier die Steilheit im Bereich des Grates mehr als 40°. / Der Aufstieg startet spektakulär. Die nun folgende Schlucht bietet ein atemberaubendes Szenario, sorgt aber auch für ein erhöhtes Gefahrenpotential. / Das sieht bereits nach Skitourencanyoning aus. / Im Frühjahr 2014 hat man den weiteren Aufstieg an der orographisch rechten Seite der Gletscherzunge fortgesetzt. Das kann sich aber infolge des Gletscherrückzugs jederzeit ändern. / In zahlreichen Spitzkehren und entlang etwas flacherer Geländestufen, allerdings im durchwegs sehr lawinengefährdeten Gelände geht es nun hinauf zum Kleinleitenferner. / Blick zum Gurglerferner. Man erkennt auch den Weg der vom Südgrat heraufkommt. / Es warten aber auch ein paar leichtere Kletterstellen auf uns, dies in Abhängigkeit von der Schneelage. Great descent across the river. 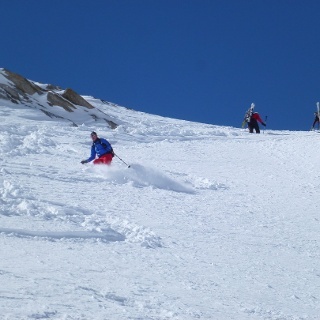 The ski tour to the Schalfkogel 3537m from the Langtalereckhütte 2430m is a serious alpine uphill ride. The highlight of the tour is the 900-meter-high descent across the river Schaffffern. However, full concentration is required from the beginning to the end. 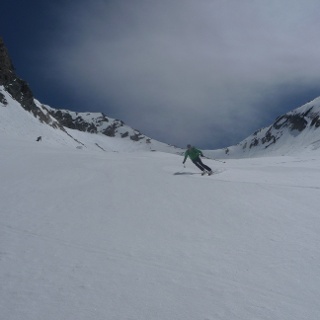 In any case, the best snow and avalanche conditions, as well as, of course, the best weather conditions must prevail. 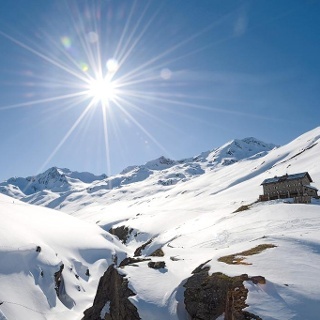 The tour begins with a 200-meter downhill descent to Gurgler Ache. At last, the last fatigue is driven out of the bone. The first highlight is the crossing of the impressive gorge, which leads us directly to the glacier tongue of the Gurgler River. One should however not be too carefree on the way, since from the surrounding steep sides a larger avalanche and Steinschlagrisiko exists. This circumstance must then be taken into account, in particular during the course of the descent, when the day's warming is noticeable at an advanced time of the day. The transfer to the Gurglerferner is subject to changes from year to year. The framework conditions can change at any time. Currently, however, the ascent to the glacier is easy and takes place in the orographic right part of the glacier. In the foreseeable future, however, the ice will probably retreat behind a rocky island. This is not affected by the approach to the foot of the east flank of the Schalfkogel 3537m. Although the ice cover sinks here too, the transition to the east flank looks unproblematic for the foreseeable future. In any case, the fact remains that we are now moving in the most extreme avalanche terrain. 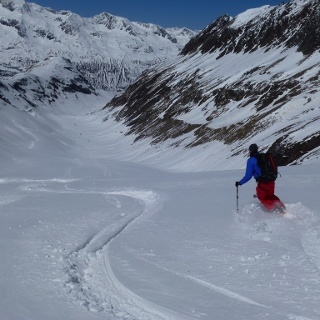 At the latest, you have to be sure that the avalanche conditions are absolutely safe. For some time you are now going uphill to the small downhill slope in the precipitous, steep, 30 ° to 40 ° steep terrain. At the Kleinleitenferner itself, the glacier from Pt.3100 will drop significantly so that the further ascent up to the Schalfjoch 3375m poses no problems. From the Schalfjoch 3375m you can climb up to Pt.3500m with skied skis in favorable snow and avalanche conditions. Otherwise, you have to keep to the south ridge (summer trail) from the Schalfjoch 3375m, the skis for a few meters shoulder and move in the rock. This is not to be missed on the last few meters to the summit. Again, the difficulties to be expected depend very much on the snow conditions. In the best case you can easily reach the summit in the Stapf. 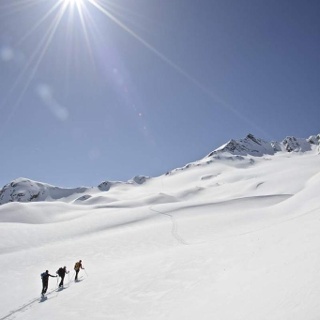 Under unfavorable conditions crampons and / or an ice ax can perform well. In addition, there is a certain degree of dizziness and steadiness, as easy block climbing can also be added. An exceedance of the summit is not absolutely necessary in order to be able to enter the Schalffner. However, from the outset, a direct departure line is obtained from the beginning of the Nordgrat. For this reason, the entrance to the north ridge is more than 40 ° incline and is accordingly avalanche-threatened. A little more favorable are the basic conditions in the skidpot at the south ridge. The descent across the cleft-rich Schalfferner is then seen from the skies to the most spectacular as the tour area around Obergurgl has to offer. 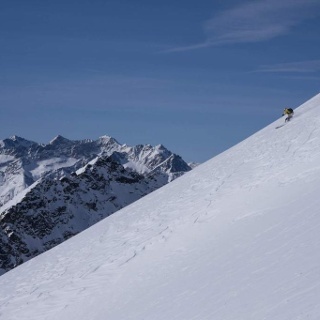 The extensive and well to be surveyed upper part of the descent goes however in the lower area, however, into a very steep, rocky, avalanche and also crash-prone section. Especially if older tracks are missing, the orientation can be difficult. 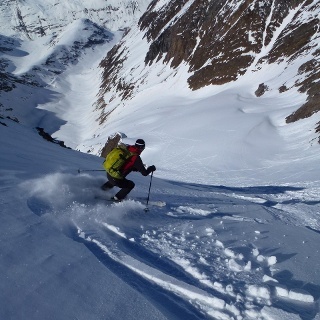 Not only for this reason, but above all in this section, this descent should only be undertaken with the best possible conditions by experienced ski climbers. From the Gurglerfer back through the narrow ravine of the Gurgler Ache one should not plan a longer stays, since the danger of rockfall and avalanche is now to be underestimated with a higher standing sun. From the Gurgler Ache up to the Langtalereckhütte 2430m, all difficulties were left behind. Now you only have to activate the ascent needles one last time and master the 200 altitude difference ascend.